If you have a dental emergency in New Bern, contact our office right away. 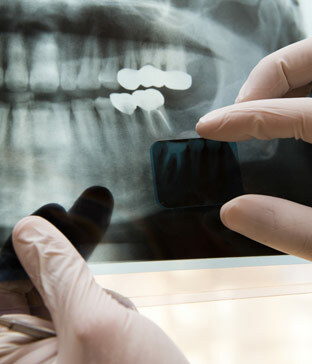 If your emergency requires immediate dental care we will do our best to work you into our schedule on the same day. After-hours messages may be left on our office answering machine, which will also provide Dr. Hand's home number for serious emergencies that cannot wait. New patients must be seen during our regular office hours. If you are unable to reach us, you should visit an Urgent Care Center or the Hospital Emergency Room. Teeth or fillings usually break because of large cavities or large fillings that have weakened the teeth. In most cases, one can detect the "missing" piece with the tongue. Sensitivity to cold and hot, and feeling a rough edge, is not uncommon. Unless there is significant pain, this problem can usually wait until regular office hours, when the dentist has staff for assistance. Orthodontic wax or temporary filling material from the drug store may help seal the sensitive parts of the tooth and/or cover the rough edges. Call for an appointment during regular hours. If a permanent crown comes off, don’t lose it! Try putting it back in place. Denture adhesive (available at most grocery, drug, and convenience stores) can be used to help hold it in. This is rarely a true emergency, but the crown should be re-cemented during regular office hours. Leaving the crown out for more than a few days may result in damage to the tooth or tooth movement that may prevent the crown from fitting back into place. DO NOT USE SUPER GLUE OR DRUG STORE TEMPORARY CEMENTS. They create more problems than they solve, some of which can render the crown unusable. Call for an appointment during regular hours. Often times, tooth structure may be broken off inside the crown and the crown will not stay in place temporarily, even with denture adhesive. The dentist will need to see it to determine if the crown is usable. Please refer to the instructions that are normally provided by the dental office. Minor bleeding is not uncommon. Place a tea bag or two, or folded sterile gauze, on the area that is bleeding, and hold a steady pressure for at least 5 minutes. Pressure on the bleeding site is very important. Once the bleeding is under control, try not to disturb the site. Profuse or persistent bleeding may require professional attention. Swelling from a dental infection can be dangerous if it progresses down the neck to interfere with breathing. This is an emergency that requires professional attention, typically a visit to an MD, the Emergency Room, or an Urgent Care Center, where an injection of antibiotics can be given and the situation closely monitored. Our staff are available to help and advise you for dental emergencies. Please don’t hesitate to contact our office.